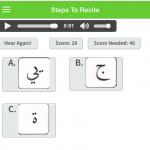 Learning to recognize letters, vowel markings, and how letters sound when they are connected is a traditional way in learning to read and recite Quran. Countless people have learned to recite Quran this way. It's a well established rite of passage for many memorizers of Quran.